Use the "Reconcile" Feature to be Accurate | THE Ultimate Bookkeeper & Accounting Service! I can’t emphasize enough how important it is to reconcile your bank account, whether you use QuickBooks or not. QuickBooks makes reconciling accounts simple, so there is NO excuse not to take advantage of this feature. If you are not reconciling your bank and credit card accounts every month, you are overlooking one of the most important aspects of your financial record-keeping. Reconciling provides a fail-safe method to ensure your financial statement dollar amounts are accurate by comparing your financial institution’s monthly statement(s) to your QuickBooks records. You may have keyed in a deposit with one less digit than it should have, or the bank could have made an error, cleared a check or a deposit for the wrong amount. You have NO WAY OF KNOWING that anything is wrong or off, if you don’t follow-up with reconciling your statements every month. QuickBooks makes this task painless with it’s reconciliation feature. Check to see that the beginning balance on the reconcile screen is the same as the beginning balance on your bank statement. Enter in the date of the statement and the ending balance. In some cases you will have to add up individual deposits on the bank statement to match the deposit amounts in the reconcile window. Again, using your bank statement, check off each of the checks and payments in the “checks and payments” column. If you need to change the amount of any item, double-click on it and QuickBooks will open it for editing. You can then update the amount, save & close and go back to your reconciliation window. If you need to add an item that is missing from your records, go back to the Banking Navigator and click on “Check Register” you can then enter in a check, deposit or other payment directly into the register. When you go back to the reconciliation window, it will be updated with the new info. Once all items have been checked off and the difference amount in the lower right hand corner of the screen says 0. Your reconciliation is complete. 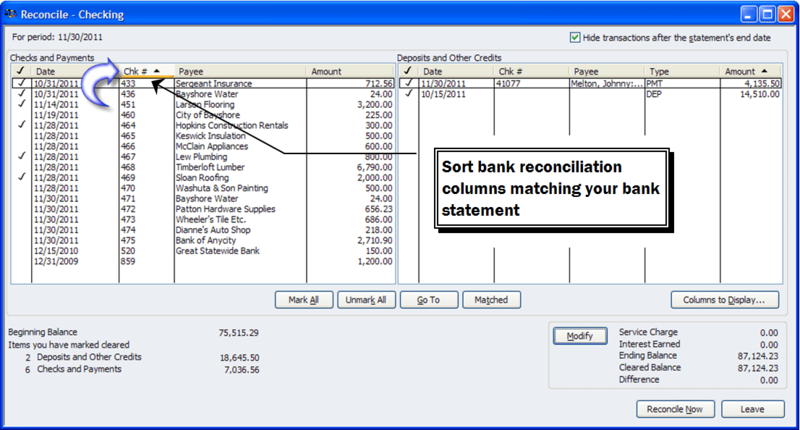 Print a Summary Reconciliation report and file it with the Bank Statement. For bank statements, I recommend you keep the reconciliation reports stapled on top of each bank statement, and start a new file for every fiscal year or calendar year, so your records match the tax year. Credit card reconciliations can be done the same way as bank statements, and should be done prior to making payments to insure the balance is correct. When you complete a credit card reconciliation, QuickBooks asks you if you want to make a payment. At this point, you can write a check on the spot or enter a bill for future payment. The QuickBooks reconciliation report should be attached to the applicable credit card statement, and filed with other statements in a paid bills file. A new paid bills file should be started with every fiscal or calendar year as well, so that your records are all organized by tax year. If you found this article helpful and want to have future articles delivered to you via email, please subscribe to my blog. If you need any help getting your bank reconciliation started or completed, or if you have any questions about reconciling your accounts, your bookkeeping, accounting or anything QuickBooks, please feel free to contact me. Wow this is a great resource…thanks. I am a new QuickBooks user and your website has been helpful. Please sign me up for your newsletter!